I was disappointed with this book, and that's a sad thing to say, because it was a lovely book. I did 'enjoy' it more than Girl (this is how Eimear referred to her first book) because it was a warm, mostly positive story, but it lacked something. It did not have the immediacy of Girl, it felt more like the character was relating something that had happened rather than the reader experiencing things in the moment that she managed to achieve so viscerally first time around. 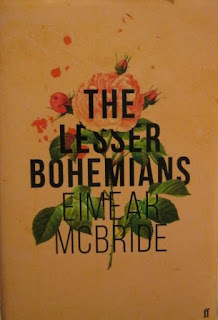 It was also the fact that where Girl was about one person, Lesser Bohemians was about two, and I felt the long section in the middle where the man describes his traumatic childhood distracted very much from the reader's experience of what the girl was thinking and feeling. It felt in someways to me, I'm sure others will disagree, that it could have been an alternative future for the girl in the first story. Eimear did talk about how she tried to link the two stories together, with dream elements (though I only noticed this occurring once, maybe I missed it). I found that I bonded much more with the male character (she did give them names but I forget now) over his loss of his daughter, and maybe he almost became a male version of the girl in Girl, falling into this terrible self-destructive behaviour to cope with the desolation he feels. She describes it as a love story, and at its very essence it is the ultimate love story, about no matter where your life has taken you love can redeem all you positive qualities and give you reasons to live.